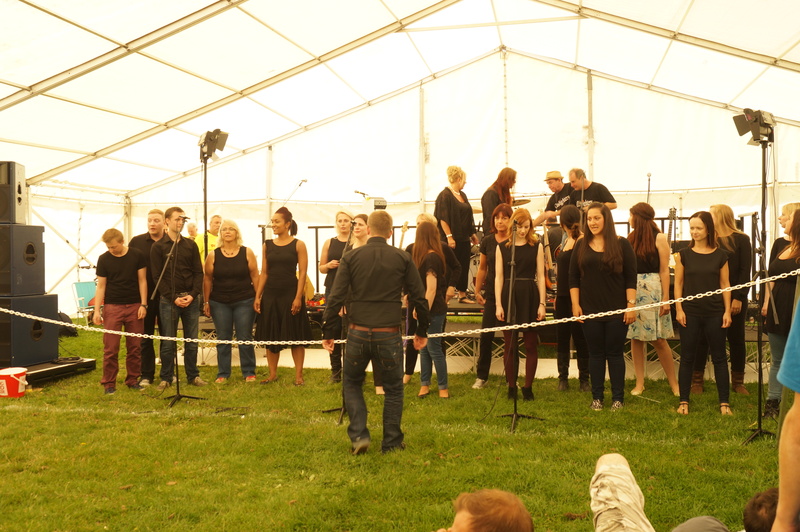 Sunday, September 7th, saw Newcastle’s Voice of the Town perform in front of a huge audience at one of the UK’s biggest sport events, the Great North Run. And getting to the finish line turned out to be a marathon not only for the runners (ok, half a one) but also for the other participants at the event, including VOTT members, due to the traffic jams and jam-packed metros. Against all odds, however Newcastle’s Voice of the Town gave a great performance in the main hub of the Charity Village. The big harmonies and the good weather managed to energise the tired runners and their proud families. Newcastle’s VOTT performance was part of a bid to help raise further money for Teenage Cancer Trust. And we were delighted to be reunited again with Mellissa Cavanagh and 2011 Britain’s Got Talent winner, Jai McDowall, to sing ‘Here We Stand’, a song written by patients from the Trust’s two units in Newcastle. If you would like to help, you can purchase the song from iTunes. Besides the cracking performance, it was a Joyful, Joyful day full of sun, laughter, cakes and back massages! Check our Facebook page to see more photos from the day.